We may flee to nature to escape civilization, but our mobile phones are one aspect of it we can never leave behind. This is not (always) something to bemoan. 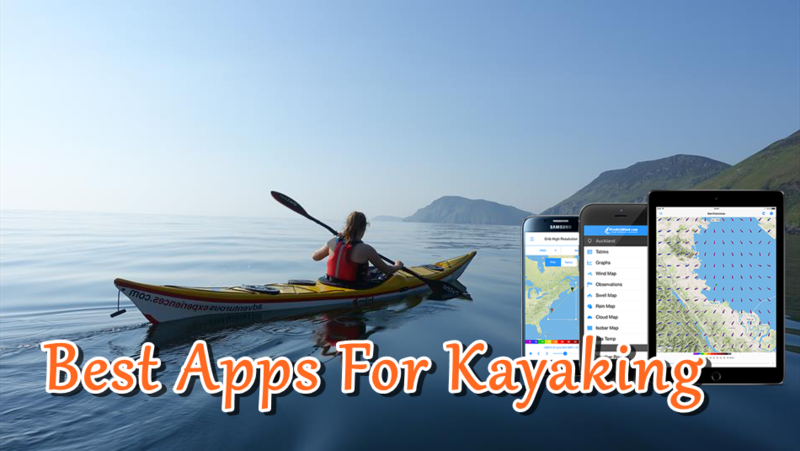 Without further ado, read on to find out what the ten best apps for kayaking are! You can go kayaking for a variety of reasons – exercise, fishing, and more. We would highly recommend FirstMate to those who do it for the second purpose. This is an app that shows you what the best fishing times each day are. You can set your schedule around sunrise/sunset, moonrise/moonset, major and minor feeding times, and current moon phase. Even if you’re going on a trip for a longer period of time, this app can still be helpful. It allows you to check the conditions in advance. Accuweather is a great app as far as safety is concerned. If you are out on the open ocean in a kayak and the weather is about to go bad, the app will tell you if it’s necessary to turn back. You get minute-by-minute forecast updates about temperature, dew point, humidity, wind speed, precipitation percentages, visibility, and more. GPS devices have been getting smaller and smaller over the years, but still, we don’t feel like carrying them around. This is where Polaris GPS comes in. This app is great for camping, hiking, biking, and other outdoor activities. It can track coordinates, magnetic heading, altitude, speed, distance, and time. It also allows users to view depth and marine features, offering marine navigation through the Military Grid Reference System (MGRS). When you’re not kayaking, you can use USGS TOPO maps to find hiking trails and campgrounds with the map library, even if you are offline. This is a great app as far as navigation is concerned. Boating USA & Canada is a super all-in-one tool that will make sure you reach your destination and are up to date on any information you may need to do so. The app indicates the best fishing areas, shallow water areas and data on wave height, wind speed and direction, air pressure, and water temperature. This is achieved via NOAA buoy trackers. You also have dock-to-dock auto routing, sonar charts, navigation modules for ETAs, weather forecasts, tide tables, and a wide variety of maps at your disposal. You’ll always be in the loop while you’re on the water with thousands of chart updates and community edits. River Data is another useful tool with many great features, providing water data for over ten thousand sites. When choosing where to kayak and why, it can be absolutely indispensable. One of the best features is the dissolved oxygen reading. This comes in real handy when you are fishing, but for general kayakers, it helps you avoid areas of stinky, mosquito-filled waters. Other bonuses include National Weather Service data for all sites, yearly historical peak stream flow readings, the ability to store the best sites under ‘favorites’, social media sharing options and navigation app compatibility. Sometimes the best apps are the most straightforward ones. It can be difficult to decide on the best place to go kayaking, just like it can be difficult to decide on the best place to have dinner. Go Paddling is an awesome resource for finding the best location to canoe, kayak, or SUP. There are over 25,000 locations pre-loaded in the app, just waiting to be tested. You’ll find launch sites and detailed notes about each place from other users. The fisherman in you will love Tides Near Me. This app offers tide tables for every day, even in the future, making it easy to plan a trip far in advance because it’s always important to check the tides for the day before heading out. This app offers tide tables and times of sunrise/sunset and moonrise/moonset. It is free to use, offering over 5,500 tidal stations. Novice kayakers may be tempted to set off as soon as they have their gear, but here’s why they should download Paddle Ready before they do that. This app is an excellent tool for learning or reviewing safety and rescue techniques. You’ll know who to contact when you’re ready to up your game with a huge database of ACA-certified instructors at your fingertips. In addition, the app offers weather forecasts, wind speed, and river readings. Safety should always come first. We recommend all kayakers double-check their skills before leaving dry land as there’s no hassle of having to carry around a book or take a course. Thank you for visiting us! Whether you’re in need of an app that tracks your location, connects you with other paddlers or keeps you up to date on weather changes, we’ve done our best to inform you. KayakBest.com is among the largest and most dedicated kayak review sites. We aim to help enthusiasts discover the best tips and products for an enjoyable paddling experience.